Dr.Malpani's Blog: A super duper IVF success story ! A super duper IVF success story ! You hear IVF success stories every now and again but I'm sure ours will be a super duper one!!! We, Susan and Sunil Silva got married 11 years ago, we didn't have (any biological) kids because my husband had undergone a vasectomy in his previous marriage, after fathering 2 boys. The elder one is with his ex while the younger one chose to be with us- apple of my eye, my son! About 7 years ago we started thinking about having one more child and and decided to give it a try undergoing an ivf! I started reading and searching for good clinics in the internet and always Dr Malpani's clinic came first in the list and I literally developed a virtual faith/trust to that clinic. Moreover the advice/second opinion which I got from Dr Malpani boosted my confidence and I was damn certain I want to go to Malpani's for my ivf. Unfortunately my husband was dead against about the idea of going to Mumbai for an ivf when there are n number of ivf clinics in Chennai itself! So we tried ivf in a clinic here in Chennai where which not only wasn't successful but also the whole episode highly unprofessional. There was absolutely no transparency as far as the treatment was concerned and we just left the idea of trying another cycle for a while then. Then two years ago we decided to try another cycle (better late than never!) and this time my husband let me decide on the clinic (I made his life miserable enough for for 2 years for not listening to me, so much so that he would've taken me to moon if that's where I wanted to go for my ivf! ;)!!! There was no doubt in my mind where I wanted to go! I landed in Mumbai in June 2012, the first meeting up with Dr Malpani itself made me think extremely positive about the whole exercise. I got conceived in the first chance itself with TWINS!!! I gave birth to my baby boys Jordan and Aidan in Feb 2013!!! Yippee!!! The story doesn't end over here! My brother was diagnosed with obstructive azoospermia about 4 years ago and was left with no choice but ivf in order to have a child of his own! Both my sister in law and my brother tried an ivf cycle in kerala (against my advice on Malpani clinic) 3 years ago which was again a failure.. So vague that clinic was, they haven't even got a treatment copy from there! 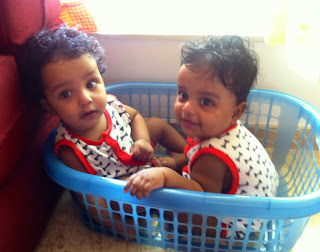 Seeing me pregnant with twins, they too wanted to try their next cycle in Malpani's. They both started their treatment in June 2013, exactly a year after my visit! Why do IVF patients put up with so much rubbish ? Why should I question my IVF doctor ? I Will Teach You to be Healthy ! The Ideal IVF Patient ! From a prospective parent ! How to not get quacked ! Our most awaited gift has arrived!